To begin with, I'll state here that I am for the implementation of the GST (Goods &Services Tax) in Malaysia. Whether you agree to it or otherwise, 160 countries in the world think VAT/GST is the one that is right for them. 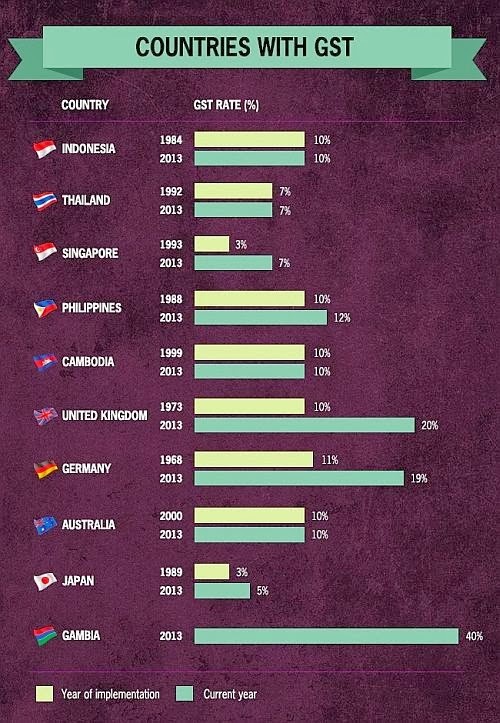 In the ASEAN region, only Malaysia, Myanmar and Brunei have yet to adopt this taxation system. I read that many people are unhappy with the proposed GST rate of 6% as they are worried that this will quickly be revised and it won't be too long before it becomes double that figure. I think this is unlikely and by right it should not be the case. You don't need to be unduly worried. I say we are in the right direction. We just need to have an efficient way of enforcing the implementation, and transparent way of spending the extra billions of Ringgit collected. You can find out here what are the goods and services exempted from GST. Managing the method's resources is 1 of its responsibilities.